What is a Transcended Soul? To transcend is to rise above, to exceed any limitations or boundaries. What then is a Transcended Soul? YOU are a Transcended Soul if you are an individual who has been challenged and overcome those challenges. YOU are a Transcended Soul if you put your focus on being the best version of YOU and place your attention on higher goals. YOU are a Transcended Soul if you put others above yourself, seeing and honoring our oneness. YOU are a Transcended Soul if you gratefully accept where you are, even as you strive to live life more fully. YOU are a Transcended Soul if you realize that challenges are great opportunities for growth and you embrace them. Do any of those describe YOU? What is the Transcended Souls CommUNITY? I love the word community because to me, it says what it means. The comm in community stands for communication or communicating. Unity stands for oneness or wholeness. I saw a great commercial that had a college-aged young man playing the piano brilliantly. His fingers were dancing across the keys in a symphony of sweet sounds. Over top of the video clip of the young man playing were the words, “A piano has 88 keys”. They panned out of the shot and there was a second piano behind the youth, to his back. He turned to play the second piano and although his digits were dancing delightfully across the ivories, only a single note sounded. Then over the top of that video clip were the words, “What if they all sounded the same”. A profound point made in a simple way. We may be all different notes, but we are part of the oneness. The something that is bigger than us alone. And when we yield to the oneness and unite, we truly are whole. All that we thought was lacking is filled and we are left with massive abundance. That is what a great community will do for you. Complete you. The unity of transcended souls with the purpose of supporting and building each other up to our greatest potential and most rewarding lives. We are about love, possibilities, and opportunities. 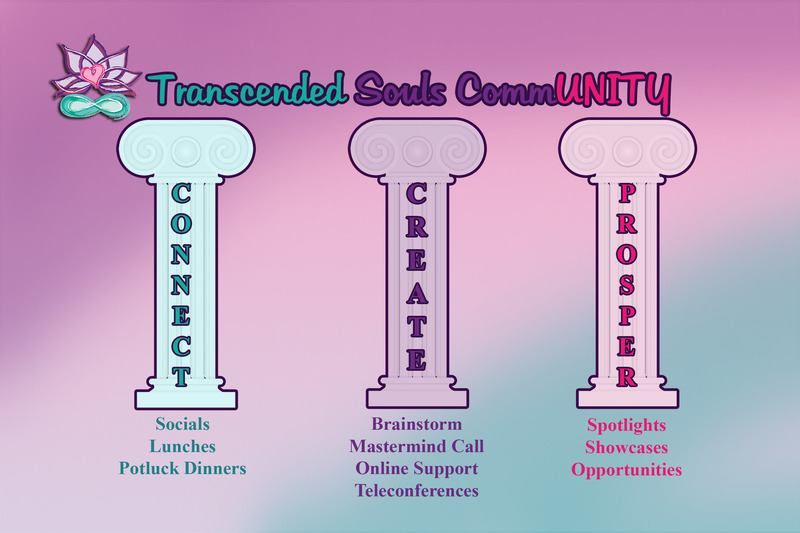 The vision of the Transcended Souls CommUNITY is to benefit our members through monthly educational meetings, social gatherings, creating a mastermind support team and showcasing the many talents and gifts of our members, so YOU can reach and exceed YOUR business and personal goals. The mission of the Transcended Souls CommUNITY is to bring together those who are seeking to learn, grow and rise above any challenges or boundaries they have through education, masterminding and creating deep and lasting relationships with an unparalleled support team. Our focus is on providing a spotlight for YOU to shine and offering opportunities to allow YOU to do, have and be anything YOU desire.